If you want a smoother, clearer complexion, Jessica Wu, M.D., assistant clinical professor of dermatology at USC Medical School and a dermatologist in Los Angeles, encourages you to toss all six of these fortifying Feed Your Face foods into your grocery cart. Definitely one of your skin’s best defenses, tomatoes contain a powerful antioxidant called lycopene. While studies have not yet been entirely conclusive, many suggest that lycopene may be responsible for helping to protect the skin against sun damage. Lycopene is best absorbed by the body when it has been cooked or processed, so eating tomato sauce, tomato paste, and ketchup is likely to be more effective than just eating raw tomatoes when trying to safeguard your skin against harmful UV rays. Lycopene is also fat soluble, which means that it is absorbed more easily when consumed with fat, such as eggs, avocado, and olive oil. Sometimes it gets a bad rap, and even though red meat does contain saturated fat and cholesterol, lean red meat is one of Dr. Wu’s favorite Feed Your Face foods because it’s so high in protein and zinc. In fact, recent studies suggest that red meat may be even better at treating acne than antibiotics. To produce collagen, your skin needs the amino acids glycine and proline, and the protein in red meat has the highest concentration of these two amino acids. The mineral zinc is also crucial for collagen production. “It’s an essential cofactor,” says Dr. Wu. “Without enough zinc, it’s difficult for the skin to make collagen. Plus, zinc is a natural anti-inflammatory.” And vegetarians don’t need to miss out. Dr. Wu adds that high concentrations of glycine can also be found in seafood, proline in cottage cheese and cabbage, and zinc in lentils, kidney beans, and raw oysters. It’s no secret that green tea is an antioxidant powerhouse. Its strong anti-inflammatory and anti-aging effects are attributed to its high concentration of catechin compounds. Studies have shown that green tea can be used both orally and topically to help protect the skin from sunburns and UV-associated skin cancers. Research also suggests that drinking one cup of green tea twice a day over the course of six months may actually reverse sun damage and significantly improve any problems you have with redness and broken capillary veins. As long as we’re going green, let’s talk about how these low-calorie beans can help you grow thicker hair and healthier nails. Green beans are a star Feed Your Face food because they’re one of the richest sources of silicon — not to be confused with silicone, which is found in bad lip jobs and breast implants! The USDA has not yet established recommended daily intakes (RDIs) of silicon, but 10 mg per day seems to be adequate for strengthening hair and nails, according to recent studies. Dr. Wu recommends choosing organic green beans, since they retain more silicon from the soil. Don’t like green beans? You can also get your silicon fix from volcanic mineral waters such as Volvic, which contains 14.5 mg per liter. Usually it’s salmon that’s synonymous with omega-3 fatty acids, but did you know that walnuts are also incredibly high in omega-3s? If you’re concerned with redness, swelling, blotchiness, acne breakouts, or wrinkles, walnuts may be your new best friend. Plant-based omega-3s, such as the ones found in walnuts, are naturally anti-inflammatory; they can help seal moisture into your skin and protect it from chemicals and other toxins. In particular, the alpha-linolenic acid (ALA) in these omega-3s can work to combat the dryness associated with aging that leads to wrinkles. But don’t stop with walnuts; you can also increase the amount of plant-based omega-3s in your diet by eating almonds, olive oil, and flaxseed, too. Not only is it the main ingredient in the best smoothies, yogurt is a natural probiotic, which means that it helps replenish the “good” bacteria in your body and keeps yeast in check. This can come in handy if you have gastrointestinal issues or you’re prone to yeast infections, but what does it have to do with feeding your face? Well, according to Dr. Wu, yogurt is an excellent Feed Your Face food for dealing with acne breakouts, eczema, and even dandruff. Just be sure to choose a low-fat and low-sugar yogurt, since sugar can aggravate inflammation. And if you think your breakouts are related to dairy, Dr. Wu suggests skipping the yogurt and going straight for a probiotic supplement instead. Going natural with your skin care is so easy with the versatile and super healthy coconut oil. This wonder oil was thrust into the spotlight when Victoria’s Secret supermodel Miranda Kerr revealed it to be her beauty secret. Extracted from ripe coconut flesh, the oil is excellent when used in cooking, but you can also use this natural beauty oil externally on your skin to get glowing and healthy complexion and battle breakouts. Here are some of the best ways to use this oil on your skin! Coconut oil is a great everyday moisturizer all over your body. Many store-bought and high-end moisturizers use coconut oil as a basic ingredient, but pure oil is more potent and clean. The good fats will make your skin elastic, soft, and hydrated. The oil might absorb slowly, but it makes your complexion beautifully glowing. Use daily, especially after a shower when your skin is ready for moisture. Rub on rough spots such as elbows, feet, and knees to make your skin look silky. Dab a bit on a cotton pad and gently swipe off makeup and dirt. It’s very gentle and soft on the skin and gives the delicate eye area skin wrinkle-fighting moisture. It’s wonderful as a fragrant massage oil all over your body. Use it on your face and massage it into your skin with your fingers from the center of the face to the outside, using soft, round motions. It boosts your circulation while hydrating and helps remove toxins. If you have acne-prone skin or get the occasional breakout, coconut oil can help. 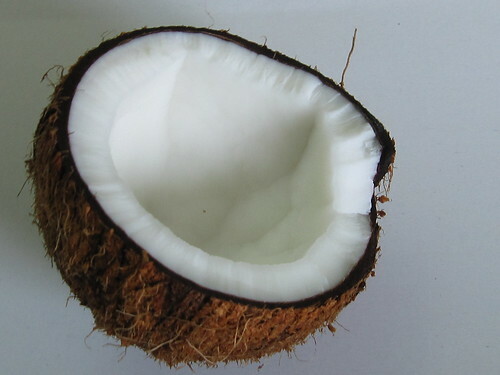 Coconut oil has antibacterial properties, so it will help to prevent spots. If you have a breakout, use a bit of oil on it as a spot treatment. In a study by University of California San Diegoreported by Science Daily, the lauric acid found in coconut oil was found to be effective against skin-dwelling bacteria. Acne conglobata: A type of severe acne defined by pimples that are connected beneath the surface of the skin. Acne mechanica: A type of acne that occurs when skin isn’t exposed to the air, something rubs against the skin, or it’s overheated. Acne vulgaris: This is the medical term for acne, or pimples. Androgens: Hormones that boost oil production by sebaceous (oil) glands in the skin. Antibiotics: Acne medication that destroys bacteria, which can cause or worsen acne. Antibiotics come in pill and topical forms (creams, lotions, ointments, and gels). Benzoyl peroxide: An ingredient in many types of topical acne medication used to destroy bacteria and treat acne. Blackhead: A pimple that isn’t inflamed and that has a dark spot in its center filled with oil and dead skin cells. Also called an open comedo. Closed comedo: A pimple that isn’t inflamed and has a white spot in its center. Also called a whitehead. Comedo: A pimple. The plural form is comedones. Comedogenic: A term used to describe ingredients in makeup or skin care products that may cause pimples. Cyst: A painful lump on the skin that may have pus, fluid, or air inside it. Deeply inflamed pimples can form cysts. Dermabrasion: A procedure to get rid of acne scars by removing the top layer of the skin. Follicle: A small opening in the skin where hair grows and sebum (oil) is excreted. Also called a pore. Hormones: These are chemicals released by the body to help regulate its many processes. Hormones related to puberty often cause acne. Inflammatory: The term used to describe a pimple that is red and irritated, often because of a reaction to a chemical or bacteria in a clogged follicle. Microcomedo: A very small comedo in its early stages. Nodulocystic acne: A very severe type of acne that causes inflamed, infected pimples that go deep into the skin. These pimples are hard to the touch and may be sore, are often purple or red in color, and can cause scars. Non-comedogenic: A term used to describe an ingredient in makeup or skin care products that is not likely to cause pimples. Non-inflammatory: A term used to describe a pimple that isn’t inflamed or red in color. Open comedo: A non-inflamed pimple with a dark spot in its center. These hard pimples are also called blackheads. Oral contraceptives: Birth control pills, which may be prescribed as acne treatment for some women. Papule: An inflamed pimple that is small, raised, and red. Papulopustular: A type of acne that includes papules and pustules. Pore: A small hole in the skin. When pores are clogged with oil, acne occurs. Also called a follicle. Post-inflammatory hyperpigmentation: The term used to describe dark skin that occurs where an inflamed pimple was located. Pustule: An inflamed pimple that has a white center surrounded by a circle of red. Retinoid: A type of acne treatment based on vitamin A.
Salicylic acid: An ingredient that is found in many types of acne treatment and topical acne medication that helps destroy bacteria and clears skin. Sebaceous glands: Glands that secrete sebum, or oil. Pimples form on the skin where these glands are located, most often on the chest, back, neck, and face. Sebum: The oil secreted by the sebaceous glands that can cause acne when too much is produced. Steroid acne: This is a type of acne that occurs as a side effect of using corticosteroid drugs for too long. Systemic treatment: This is a type of acne medication that affects the whole system, rather than just being applied to the skin. This includes pills, infusions, and injections. Topical treatment: A type of acne treatment that is applied to the skin. Lotions, creams, gels, and other solutions can be rubbed into the skin to treat acne. Whitehead: A pimple that isn’t inflamed, and is caused by dead skin cells and oil buildup clogging a follicle. Also called a closed comedo. Zit: A slang term for a pimple or acne breakout. Not enough rest and sleep deprivation may have an impact on the health and appearance of the eyes. Dark circles around the eyes can result when the skin in that area is very thin. Dark circles are accentuated when the person is tired. Raw, cold potato slices: Apply raw, cold potato slices over the eyelids keeping your eyes closed. When the potato warms, change for a new slice. Chamomile infusion: Make a chamomile tea. Soak a few cotton swabs in the infusion and apply on your closed eyes. Try leaving them on overnight. Kiwi: Place kiwi slices on the eyes for about 20 minutes. Fresh cucumber slices: Apply fresh cucumber slices to closed eyes. Green apple slices: Apply green apple slices to reduce dark circles around the eyelids. Apple sauce plaster: Boil an apple and puree. Apply apple plasters on closed eyes and let work for 40 minutes. Every night: Half cup of wheat germ oil, half a cup of peach oil, 50 g of lanolin. home-remedies-site.com Put the lanolin and the oils in a container. Place container in a water bath over low heat. Apply every night. Aloe Vera and cucumber: Aloe vera pulp and cucumber. Gently rub a little aloe vera pulp under each eye. Cover with a cucumber slice. 1 carrot and 1/2 cucumber: Grate carrot and cucumber and place them on a gauze. Put over closed eyes. Turmeric and pineapple juice: Make a cream with an Oriental spice called turmeric mixed with pineapple juice. Apply to dark circles. Almond or castor oils: Every night before bedtime apply castor or sweet almonds oils to dark circles. You will see an improvement in two weeks. Bags under the eyes may be due to the accumulation of toxins, water, and fat. Reduce your daily intake of salt and drink enough water. Give yourself a massage, gently press around the eye with the index finger and finish in the tear duct. Repeat at least 5 times for each eye. Make an infusion of watercress and raw potato and put compresses on the eyes. You can also apply castor oil around the eyes before going to bed. Put on chilled coffee (caffeinated) compresses for 10 minutes. Put two spoons in the freezer. The next day place the concave part of each spoon on each eye for five minutes. Green tea is a very effective anti-inflammatory. Make a cup of green tea and make some ice cubes with it. When ready, massage your eyes with the frozen green tea cubes. Moisten two chamomile tea bags with cold water and place them on your closed eyes for 15 minutes. Gently tap puffy areas on your upper and lower lids using your fingertips. Hold a bag of frozen peas to your eyes for a few minutes. Cut thin slices of melon and place over closed eyes for 10 minutes. Important! Do not use these or any home remedies until you have asked your doctor first. “Natural” does not mean it is safe for everybody. Chamomile tea has been a very common remedy through the ages. It has many health benefits and no reported side effects. However, its use is not recommended during the first trimester of pregnancy or for people that are allergic to daisies. Chamomile tea health benefits are cumulative. That is, they increase with regular use. Taken moderately, chamomile tea can be used for an indefinite period of time without any problems. Lotion and potions that promise smooth skin and shiny hair often come with hefty price tags and contain synthetic chemicals that may be doing more harm than good. Luckily, many of the items you keep in your kitchen to fix healthy meals can be applied directly to the skin to help your natural beauty shine through. Strawberries contain enzymes that work to brighten skin and remove dead cells. For a nonabrasive exfoliant, try blending a few strawberries with a spoonful of honey and massaging it into your face or any other parts of the body that need softening. Oranges are also a great ingredient to remove rough patches. To smooth elbows, knees and feet, simply rub a cut orange half into the skin, then follow up with a mixture of olive oil and sugar and rinse off the concoction. Blueberries contain powerful antioxidants that may penetrate the skin and help reduce damage done by ultraviolet rays. For a natural anti-aging mask, mix mashed berries with plain yogurt, apply to your face and let it sit for 15 minutes before rinsing. If you’ve tried bath salts and were left with irritated skin, you are probably too sensitive for them. Instead, try pouring a gallon of whole milk into your warm bath; the lactic acid will gently exfoliate your skin. This is especially soothing for individuals with eczema or psoriasis. Hair products that contain silicone can offer temporary shine but may also lead to dullness and buildup over time. Instead, try treating your locks to a blend of one banana and half of an avocado. Work the mixture through your hair, cover with a plastic cap and heat gently with a blow dryer to help it penetrate the hair shafts. If your mane is damaged and weak, try blending together one egg, two tablespoons of coconut or other vegetable oil and the same amount of sesame oil. After applying this to the hair, wrap your head in a warm towel and let it soak in before shampooing it out. Beer can do more than help you relax after a long day at work. It’s also a great post-shampoo rinse. Choose a dark variety for optimal results, and avoid taking glass bottles into the shower with you. Of course, for optimal results, it’s important to also eat these healthy foods, since proper nutrition is one of the best things you can do for your body, both inside and out. As we age, fine lines under the eye are common. For many it may not be cause of concern as they consider it as a natural process. However, there are others who may not like to have lines or marks under their eyes. Especially for women it’s a terrifying dream. They consider fine lines below their eyes as an impingement in their beautiful look. Besides, having the lines under their eyes may make a person look much older than he or she is. Fine lines under the eyes are first to appear as aging process, this is because the skin under the eye is most delicate and thin. What Causes Fine Lines Under Eyes? Besides the natural cause such as aging, there are many other causes where a person may have premature fine lines or marks under their eyes. Let us know various factors attributing fine lines under the eyes. Knowing the reasons will aid you to prevent fine lines from developing. As a person ages, the elastin and collagen that maintains the skin support, breaks down. The regeneration of skin cells also starts slowing down. The skin becomes drier and it loses its elasticity. All these factors attribute for development of fine lines under the eyes. Smokers are known to have premature wrinkling and fine lines on their face. People who work or are exposed to sunlight for long duration are susceptible for early fine lines under their eyes. A squint also gets premature wrinkling and fine lines under his eyes than those who do not have this eye abnormality. Irregular sleeping habits and insomnia can also trigger early fine lines. While some people spend lot of money on salons and parlor for getting rid of fine lines below their eyes, there are simpler options that are economical for your wallet. These home remedies are as efficient as any other cosmetic process. Let us know few of these important home remedies. Castor oil: apply castor oil around the eye and gently massage the area. Castor oil is a good moisturizer. It nourishes the delicate area under the eye. You can add egg white to castor for extra benefit. Coconut milk: a gentle massage with coconut milk around the eye relaxes the underlying skin tissue as well helps in proper circulation. The middle portion of pineapple is known to diminish the fine lines under the eye. Rub it lightly over the fine lines regularly. To keep your skin well moisturized drink enough water daily. Let the skin remain well hydrated. Certain yoga exercises are known to decrease fine lines and prevent them from occurring. Other treatment option known to successfully treat fine lines include laser therapy, skin peeling and dermabrasion. All these procedures are done by professionals. Protect your face and skin from the harmful ultraviolet rays of the sun by wearing a hat or applying sunscreen or by wearing glasses. Avoid unhealthy lifestyle. Do not smoke as it is considered to be an important factor for premature aging. Keep the skin around the eye well moisturized. Apply a moisturizer and massage the area regularly if you want to reduce the fine lines. You look great and your skin is radiant, but you raise your arms and your underarms tell a whole new story. They are dark, rough, and not so pleasant; they even restrict you from wearing those gorgeous halters, racer backs, or even plain sleeveless tops. But you are not alone. There are many young and old women who suffer from this problem and don’t know how to deal with it. Before treating the dark skin of the underarms, it is imperative to understand the reasons behind it. The primary reasons for darkened skin are friction and uric acid built up due to perspiration. Amongst the other reasons, obesity, shaving underarm hair and excessive use of antiperspirants and deodorants are the most common reasons for hyper-pigmentation. It is best to use these chemical based products sparingly. Instead any good talc can work effectively. To start with treating dark underarms, you must employ a good cleansing routine, which involves cleaning the grime, dust and uric acid deposit and exfoliating the dead cells in the region. This must be followed by topical application of ingredients, which have bleaching properties to lighten the dark skin. A paste of gram flour, turmeric and milk is very effective substitute for soap. Alternatively, a mild soap which helps retain moisture and cleans well can be used. Coarsely powdered almonds mixed with milk make a good scrub. Almonds have vital nutrients, which are good for the skin and milk keeps the skin soft. Granulated sugar is also effective in exfoliating dead skin cells. Lime juice is one of the best bleaching agents. Mix it with honey and turmeric and you have an instant bleaching pack. Or you can simply dab it on the face with cotton before stepping out in the sun. Papaya contains papain, which also helps lighten dark skin. Rub a papaya slice twice a day and keep it for 20 minutes before washing off. Raw milk contains lactic acid, which acts as a skin peel and removes old surface epidermal skin cells to reveal the younger layer. Dryness is also known to darken the skin. Pamper your underarms with the goodness of cocoa butter. It is a great moisturizer and helps keep the skin soft. Additionally it is also very effective in lightening the skin. In addition to the above regimen, one must take care so as to avoid wearing synthetic clothing. Rather opt for natural fibers such as cotton, flax, bamboo which allow the skin to breathe and keep it cool and dry.